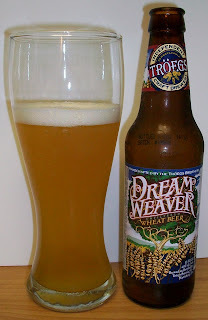 Commercial Description:Long toasty days, cool breezy nights and a splash of magic provide the inspiration for the Troegs brothers’ dreamiest Single Batch creation—Dreamweaver Wheat. 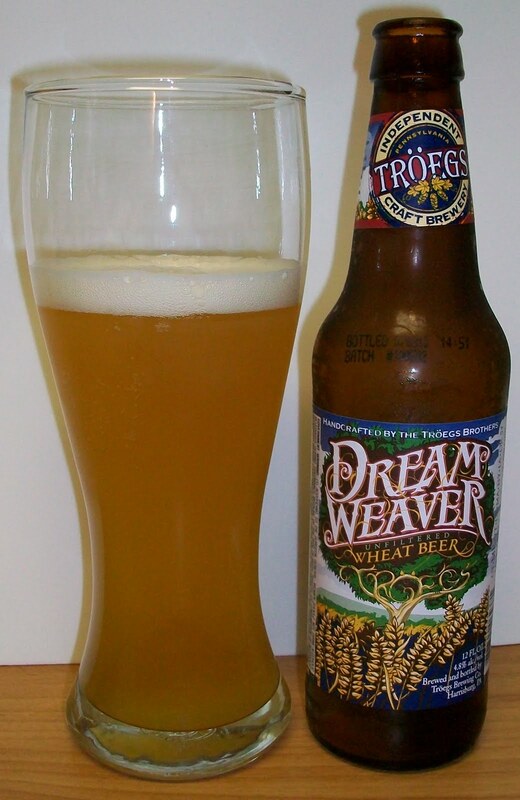 Combining four wheat types with Munich and Pils malts, noble Saaz hops, and a yeast strain that imparts a spicy, peppery, clove taste with a slight hint of bananas, Dreamweaver Wheat is an unfiltered blast of spicy, mouthwatering joy. Background:I actually picked this up for smoking pork ribs. Yes, I can put beer on just about anything. After hours of smoking I wrap them in foil and re-hydrate a little with a good wheat beer. I had a few left over so I decided to review one. Review:The beer pours a hazy pale straw with orange hues and a white head. The nose is all Hefeweizen; sweet light malts, clove, banana along with a nice yeasty aroma. Now that’s a summer beer! The tasting experience starts out with sweet light malts up front on the tip of the tongue, then the most refreshing effervescence over the tongue in mid-sip. The back-end is clean and crisp and very easy to swallow. This is one easy drinking refreshing beer. The finish is also very refreshing with some peppery notes, citrus, spice and banana notes as well. It sounds like a lot but these are all light flavors which make this beer very refreshing and easy drinking. There is not much of a final aftertaste just some lingering yeasty flavors along with some citrus notes. This is a very refreshing beer. Actually maybe too refreshing, It’s gone already. Oh Well, I guess I’ll just have to have another one while I work on my final thoughts. I really like this beer. It’s funny that I always thought this was an American Wheat ale but it’s more like a light Hefeweizen. Actually this is classified as both. Ratebeer.com has it as a German style Hefeweizen and beeradvocate.com has it classified as an American Pale Wheat beer. I think this is definitely more a Hefe than an American Pale Wheat. It is lighter than a typical German Hefeweizen but that may make it more refreshing. I’m really enjoying this second one. This is a great beer to have on a hot summer afternoon. Even as this beer warms it remains refreshing. It also picked up nothing unpleasant as it warms. I’m going for a B on this one. This is a very refreshing excellent summer ale. It may be a little too light for an authentic German Hefeweizen. But it is so refreshing I’m sticking with a B. This is just a overall great summer ale. I highly recommend this beer to anyone looking for a lighter summer beer. This one has just about everything going for it.